Spring Garden School at 12th and Ogden Streets in North Philadelphia, prior to redevelopment. Philadelphia has been recognized in recent years as a national leader in eliminating homelessness among its veteran population. Between 2013 and the start of this year, the city and affiliated advocacy groups found permanent homes for 1,390 veterans living on the streets. "You have actually done it," U.S. Housing and Urban Development Secretary Julian Castro said at the time. "You have effectively ended veteran homelessness. The thing is that we can’t stop our work until every single veteran has a place to call home in the United States." Thanks to a partnership between the Philadelphia Housing Authority and HELP USA, a new conversion project at the historic Spring Garden School will keep the city's momentum going in the right direction. At a Sept. 23 groundbreaking ceremony, city officials and representatives from HELP USA unveiled their plans for the vacant building at 12th and Ogden Streets, which has sat unoccupied for more than 40 years. "It would have been far too expensive and a shame to tear it down," David Cleghorn, Senior Vice President of Real Estate Development at HELP USA, told PhillyVoice. "We haven't gotten any pushback or a single negative comment on this project. The building has been an eyesore for a while and a safety issue that needed to be addressed. People are excited about it." Constructed in 1927 and added to the National Register of Historic Places in 1986, Spring Garden School will be HELP USA's fifth project in Philadelphia, where the nonprofit has invested about $56 million for low-income and special needs housing. A 99-year ground lease between PHA and HELP USA will underlie a $14.5 million capital project including 37 units of affordable housing for low-income seniors, primarily veterans. A full 12 of the units will be reserved for homeless veterans. HELP USA, which has secured $13.7 million in public and private funding for the project, will be aided by a $9.5 million investment from PHA over the next 20 years. Two other HELP USA projects in southwest Philadelphia, the Hardy Williams Veterans Center and the Robert A. Brady townhome community, are also catered toward providing permanent housing and assistance to veterans. "All of these projects are immensely successful," Cleghorn said. "Once these vets are in our apartments, they have support services right there on site. What keeps them there is that they really form a community of shared military experience. They look out for one another. They're happy and proud of where they live, and that makes us happy and proud." Launched in 1986, HELP USA began solely in the realm of homeless shelters and homeless services in New York City. The addition of permanent housing projects came in the early 1990s as a way to provide the end of the continuum of care. "Our housing projects in Philadelphia started in the late '90s," Cleghorn said. "Some are for seniors 55 and up and others are for veterans, many of them formerly homeless and recovering from substance abuse, others with mental health conditions or disabilities." Cleghorn explained that he grew up in a family that ran homeless shelters and wanted to work on a larger scale. He's overseen HELP USA's housing projects from conception to completion and worked to provide hope for a variety of vulnerable demographics. "We try to fill needs when there's a need," Cleghorn said. "We've built houses for people with HIV, victims of domestic violence and communities that live with mental health conditions. It's a no-brainer for veterans. They've made sacrifices for us and they deserve to have a place to live. It's the right thing to do." Kelvin A. Jeremiah, President and CEO of PHA, emphasized the importance of ensuring that these populations have stable housing opportunities even as they become increasingly difficult to guarantee. Renovation work at the school will restore both the interior and exterior of the structure, installing a rooftop garden and adding a soccer field for neighborhood children. Even some of the building's storied graffiti will be preserved. "Through the pre-development process, I've been going into the building for a couple years," Cleghorn said. "Every time it's different. People are constantly going in there and creating new stuff. One of my colleagues is a big proponent of street art and suggested that we keep some of it." Blackboards in each classroom, considered the prize real estate for street artists, will be preserved both in the building's main lobby and in HELP USA's New York offices. 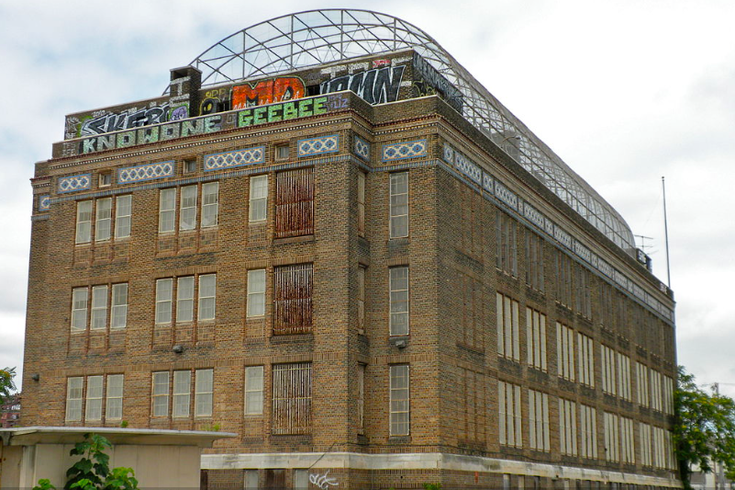 "The building's management office will have a blackboard, a historic photo of the Spring Garden School, a gallery of graffiti at the site and post-construction photos," Cleghorn said. In collaboration with Drexel University and other community partners, HELP USA will provide a range of on-site services including healthcare, counseling, employment and youth mentorship programs. Work at the site is expected to conclude around the middle of 2017. Individuals and families are expected to begin moving in by the end of 2017. The video below gives a good look at the building's interior and some of the art that lived there in 2013 (h/t Philly Curbed).